Good morning! 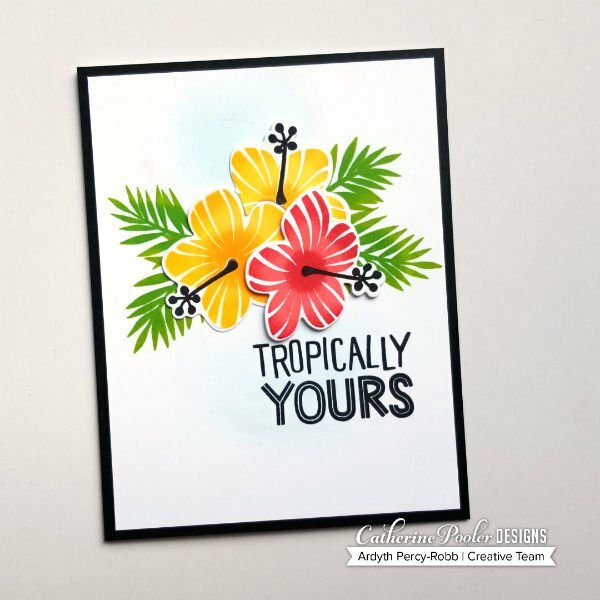 It's Ardyth and I'm excited to be here on Catherine's blog with this card using stamps and dies from the Tropically Yours Stamp of Approval Collection. I started with a white panel trimmed to 4 x 5 1/4. I lightly blended Fiesta Blue ink onto the centre. Next, I stamped the leaves with Lime Rickey, using a stamp positioner. This allowed me to add some depth to the centres of the leaves with Aquatini ink. On a separate panel, I stamped a flower with Limoncello ink, using a stamp positioner. I used a sponge dauber to add Tiki Torch ink to the centre and edges of the flower, to create dimension. I used the same method to stamp another yellow flower and then another, this time using Coral Cabana and Tutti Frutti inks. I added the stamens with black ink. I die cut the flowers and arranged them on my card front. Before I glued them down, I placed my sentiment on my stamp positioner, removed the flowers and then stamped with Midnight ink. I adhered the flowers to the white panel, popping up the Coral flower for some more dimension. To finish my card, I glued the completed panel to a black 4 1/4 x5 1/2 card base. These pops of tropical colours are warm and sunny and perfect for this summertime card! The Stamp of Approval Collections are while supplies last, so be sure to grab yours before they're gone! 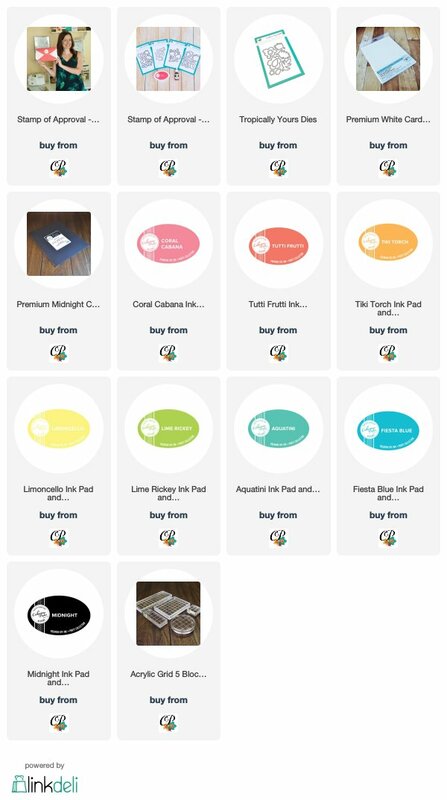 Click here to visit the shop to grab it now.